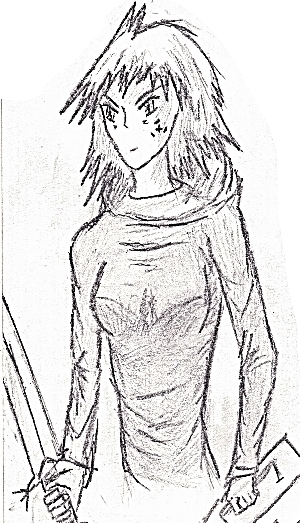 Laina is the leader of the medical division on Reiko-10. Somewhat brash, she has a deep well of combat medical experience behind her with some truly amazing saves. She is friendly but does not take criticism of her skills well. Laina’s life was shaped by an event she experienced early in her childhood. Playing at, ironically later, a medical training education facility, her life had been as normal as anyone else’s up until that point. Her educator was involved in a complex drug trafficking scheme that had gone bad. Laina was playing when two men kicked open the door and gunned down her educator right in front of her eyes before leaving without saying anything or shooting any of the children. As she was so young, she did not understand matters of murder, corruption or any of the darker sides of life…and death. More than anything, the thing she recalled the most was the fact that she was covered with his splattered blood and stared at her hand she had put on him, covered in the dark red liquid, unknowing of what it was. She said that recalling that moment, the fact he was still alive and moaning meant he probably could have been saved had someone known what to do. But as it was the first life she would see depart from this mortal realm left soon in front of her young eyes. Such a strange event predictably stuck with her for a long time, and it was with a mild degree of horror as she aged and realized what actually had happened in that moment. It was fitting that Laina was in a medical education facility, because as she realized what had happened that long ago day turned into a fiery passion to never let someone else drop into death’s cold embrace while she is around. Laina is an open, friendly woman who initially seems laidback, and for the most part is. She and Kalco make an entertaining couple as his boisterous, loud self seems to be in check with Laina’s calm presence. However that part of her persona is immediately dropped when there is an emergency or someone’s life is on the line; she becomes incredibly focused and decisive, bringing every resource she can muster towards fixing the problem. She is caring for others to the point of compulsiveness, not so much that anyone would want her to get away from them while she is saving their life, but the compulsiveness is more of the often unnecessary danger she sometimes puts herself in just to save others. One of the most striking things someone would find if they got to know her is if she ever talks about how many people she saved (which would have to have been brought up by the person talking to her as she never mentioned it otherwise). She answers by holding up four fingers, ‘Four hundred? Maybe four thousand?’ they would ask her.